With 39 Years of impeccable legacy, IMT Ghaziabad, a top ranked management institute in India today organised its prestigious convocation ceremony. Mr. Natarajan Chandrasekaran, Chairman Tata Sons graced the annual convocation of IMT Ghaziabad as the Chief Guest. He delivered the convocation address and conferred the medals and the awards to the meritorious students and distinguished alumni. 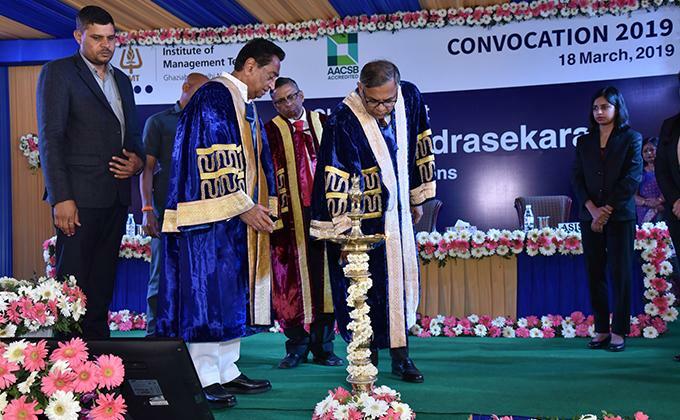 Shri Kamal Nath, Honourable Chief Minister, Madhya Pradesh also graced the convocation ceremony and addressed the students of IMT Ghaziabad at Convocation 2019. The ceremony was held at IMT Ghaziabad campus in the presence of Students, Parents and eminent dignitaries from the industry. Shri Kamal Nath, Honourable Chief Minister, Madhya Pradesh addressed the students on their big day, “I am delighted to be here again. As you walk out of here to face the world, one of your biggest challenge will be to adopt and adapt in the changing world. The disruptions of technology is shrinking down the life of technology every day. Global trade patterns are evolving dynamically and your battle will be to adapt at the same speed." A total number of 762 students (including PGDM Executive and PGDM Part Time students) were conferred with a PGDM at the convocation ceremony. IMT Ghaziabad also presented gold medals to the young achievers and toppers. The event also witnessed announcement of four prestigious awards. Distinguished Alumni Award was given to Mr. Jacob T Jacob, Head Print Business ( South East Asia and Korea), HP. Every year, since 1985 IMT confers a Distinguished Alumni Award to their alumni for exceptional contribution to the industry and the institute. Ms. Vidyun Goel Director, Toy Bank and Mr. Prateek Gupta, Co-Founder and MD, Wadi.com bagged the Young Alumnus Award. Vishit Jain Memorial Award was given to Ankita Joshi for exemplary all-round performance.